As non-conventional forms of employment grow, we see workers and gig economy giants do battle over labour rights. Last month, the UK saw a legal win for gig economy workers as 50 Deliveroo riders shared a six-figure payout after being allowed to challenge Deliveroo who settled, fearing that its employment contract would be ruled as having breached human rights. This dispute is part of a wave of sweeping through Europe as gig workers are banding together to improve their labour rights. The union behind the gig workers in the Deliveroo dispute were part of the Independent Workers’ Union of Great Britain (IWGB) which is the first union in the UK to be recognised by an organisation that uses gig workers. The case saw the IWGB win the first round as the high court gave permission for a full judicial review of the ruling which had been given by the Central Arbitration Committee (CAC) in November last year. The high court agreed with the CAC’s conclusion that riders could not be classified as workers with the right to collective bargaining, but also said on the basis of Article 11 of the European convention on human rights, that it is arguable that the Deliveroo riders should have the right to bargain collectively. In doing so, the dispute expanded from just an employment rights issue to a human rights matter edging workers and trade unions closer to victory against companies who build their success on an exploitative business model. This success paves the way for future gig economy workers to challenge their employers on the basis of human rights, with Deliveroo also facing a parliamentary inquiry into the pay and conditions of its couriers. The CAC challenge also saw an immediate impact on labour rights as the case saw an examination of the contracts for Deliveroo riders which were updated during the process of the case. This success followed the employment rights of gig economy workers having been elevated by another case where a heating engineer who worked for Pimlico Plumbers was established by the supreme court as a worker and not self-employed. This is a significant precedent for similar legal battles in the gig economy such as those for Uber and Addison Lee which have been in dispute with their drivers over employment status. What this means for others like the heating engineer is that they may have greater access to the wider employment protection rights given to full-time staff. Whilst the specificity of the case to the situation of the parties involved limits the impact that the specific precedent can have on future cases, the decision could nonetheless affect around 4.8 million subcontractors in the UK. The chief executive of the Equality and Human Rights Commission, Rebecca Hilsenrath said in reference to the case “If you wear the uniform, if you drive the branded vehicle, if you only work for one business, you are employed”, outlining the conditions through which the court ruling was made. She continues to outline that workers who fit those criteria are “entitled to the appropriate protections and adjustments which go with the job, to enable you to work safely and productively” and states that thousands of workers will find themselves with added security benefits like sick pay and holiday pay. During the FIFA World Cup final, there was a big shake-up in the French gig economy as Uber Eats, Deliveroo, Foodora, Stuart and Glovo workers protested and held a strike organised by the Independent Deliverymens’ Collective in Paris (CLAP). This showed the growing strength that such unions command especially on such days of elevated consumer spending. Besides these pressures on gig economy giants during one of the most profitable weeks they could hope for, regulatory pressures have already seen to create change as in May, Uber agreed to offer paid sick leave and other health benefits to its EU deliverers and drivers. 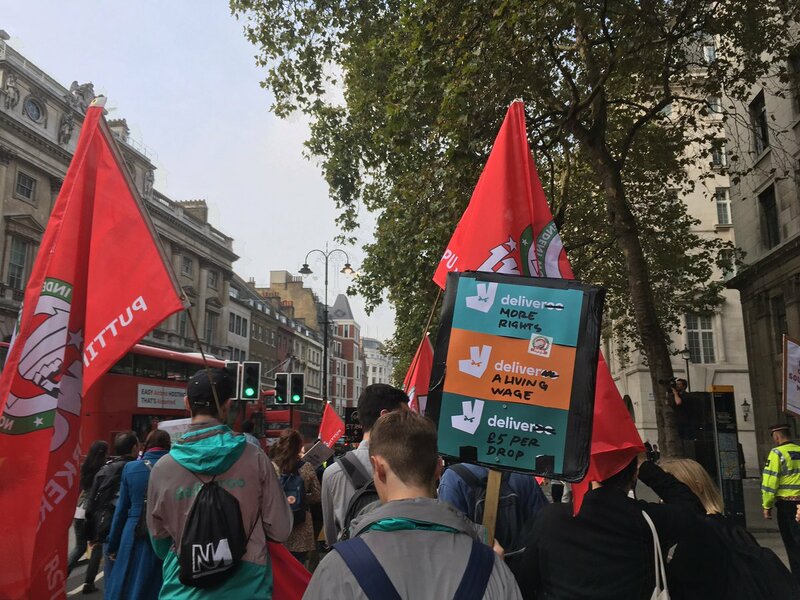 Where advancing rights are significant to a growing amount of workers in a growing form of work, it has been expressed that riders do not want to risk the freedom and flexibility of self-employment; though, this came from a spokesperson for Deliveroo. Hence, gig economy workers in Europe should know what they are getting themselves into and how to protect their rights once they’ve entered the gig workforce.